A branch fell on the presidential motorcade Saturday. Washington (CNN) - President Obama ditched his souped-up Cadillac limousine fondly known as "the Beast" this weekend for a vehicle capable of plowing through 20-plus inches of snow. Obama is traveling in an armored Chevy Suburban four-wheel-drive SUV to ensure he keeps to his schedule, despite the harrowing weather conditions. The blizzard Obama called "snowmageddon" didn't stop his presidential motorcade from navigating the snow-covered streets of Washington Saturday, but it did cause a few hairy moments. Before the 15-vehicle motorcade even pulled out of the White House driveway, one of the emergency support vehicles in the caravan lost traction and slid into another vehicle. Fortunately, its occupants – members of the media – hadn't yet loaded into the Chrysler Aspen SUV when the minor collision happened. President Obama's five-minute journey from 1600 Pennsylvania Avenue to the Capital Hilton, where he spoke to a DNC gathering, was slow-going. Under constant snow fall, the vehicles inched forward at 15 miles per hour. But the scariest moment came when the motorcade was returning from the president's event. 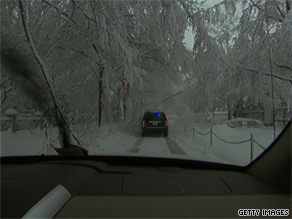 On a narrow road between the Treasury Department and the White House, a tree branch, weighed down by the snow, snapped and fell onto a vehicle carrying members of the media. White House press assistant Ben Finkenbinder, along with reporters and still photographers, jumped out of the SUV. The driver pulled the branch from the roof and within a minute the group continued on their way to the White House south lawn. No one was hurt, and the president, in a vehicle several cars ahead, continued on to the White House, not even noticing the motorcade "snow-fu." Our Persident has by incorporaing a the word armageddon into a phrase not at all related to war has demonstrated his inability to comprehend what war is. This behavior causes me to question why we elected such an immature person and placed him in direct control of weapons of mass destruction. I thnik we made an error in judgment. Wow, this is top news right here! I can't wait for FoxNews to call this fallen tree branch an act of terrorism. That was 2 minute of my life that I'll never get back. wow...is this newsworthy or what? Are you kidding me that this is freaking news the man is doing his job if you can call it that. Maybe they shouldn't have gone out in such bad weather.